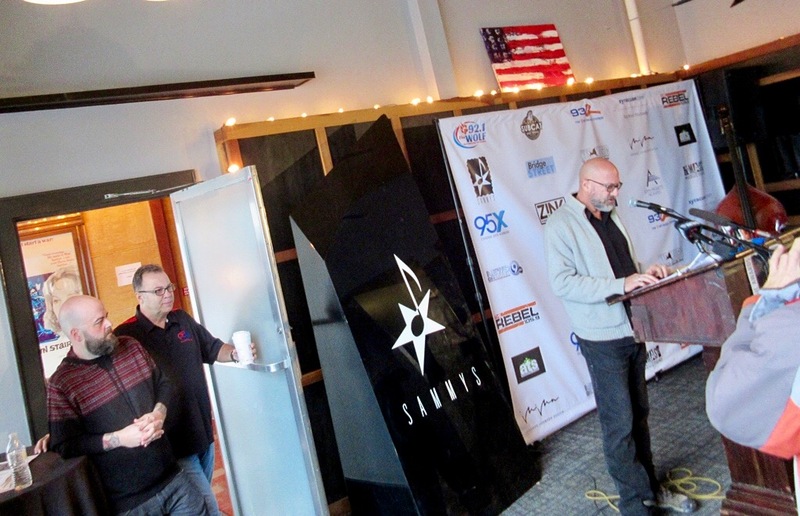 They announced a lot of cool news about the Syracuse Area Music Awards at a news conference Tuesday morning at the Palace Theatre in Eastwood. I was lucky enough to have a good reason to take the time from my job at the library to get there. The Cadleys warm up the media folks with Americana. The news included that jam band moe. was not only being inducted into the Hall of Fame at the March 2 ceremony at Upstairs at the Dinosaur Bar-B-Que, but would bear performing March 3 in the awards ceremonies at the Palace. That band was put together in the 1990s by Utica-area guys Al Schnier, Chuck Garvey, Rob Derhak, Jim Laughlin and Vinnie Amico, and has continued to flourish, 24 albums worth. Three popular Syracuse radio hosts take turns announcing “best-of” nominations: Scott Dixon, Skip Clark and Dave Frisina, left to right. Syracuse music veteran Joe Whiting will be going into the hall again with longtime fellow music-maker Mark Doyle, this time as part of their original band Jukin’ Bone. Whiting told me afterward that this is special because a roster of band mates would go in with them. The band bio given out Tuesday includes with Whiting and Doyle George Egosarian, John DeMaso, Tom Glaister, Bill Irvin, Barry Maturevitz, Danny Coward and Kevin Schwaryk. Other farmers include Meegan Voss and Paul Case. And then there’s the husband-and-wife team for Music Educator of the Year, Anthony and Patricia DeAngelis, and Lifetime Achievement Award recipient Vincent Falcons, longtime band leader for Frank Sinatra. I thought back to times I interviewed those folks during my two-decades plus as music writer for the big daily. 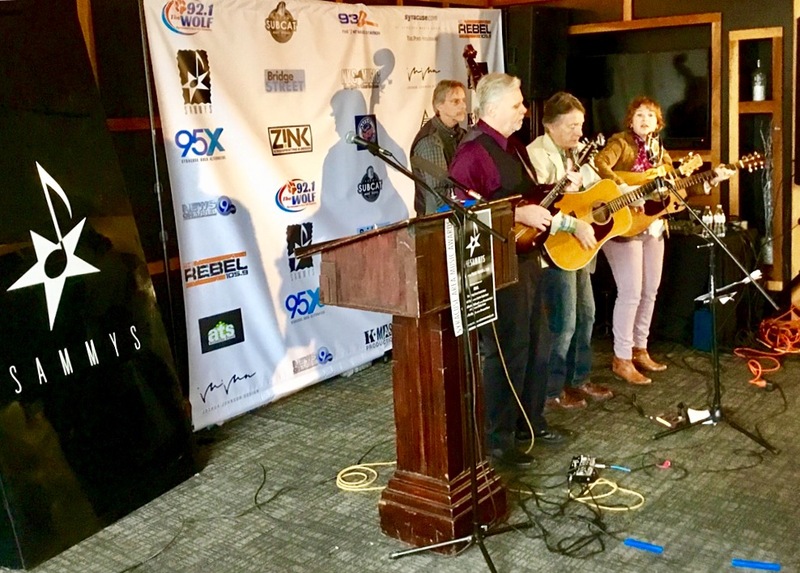 I heard many more familiar names as popular and important local radio hosts Scott Dixon, Skip Clark and Dave Frisina announced the nominations in the 13 best-of CD categories. I also heard new names that have emerged in the scene in the four years since I left that job. That’s important for the Syracuse scene. That makes me happy to declare that my job in communications is for a library that carries deep ties with local music, staging concerts in the Carman Community Room regularly. I get to take the photos and videos for our social media. Now I can say that a renovation of our site LPL.org that will be revealed soon enough will include a blog, many times written by me. There will be posts about local music, including CD reviews, much like the ones that have appeared right here. Central New York musicians and studio personnel can get me CDs care of the Liverpool Public Library, 310 Tulip St., Liverpool NY 13088. After I listen to them, I’ll pass them along to the librarian who curates the library’s local music collection. Here’s a taste of the Cadleys. 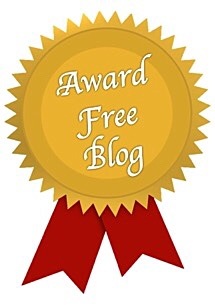 Here’s the link to the Sammys news, including all this year’s nominees. Hey Mark! This sounds like an awesome event! I love the sound of The Cadleys, and I love that you get to be a part of this. Thanks for sharing! Thanks, TPC. Syracuse is fortunate to celebrate the scene like this.